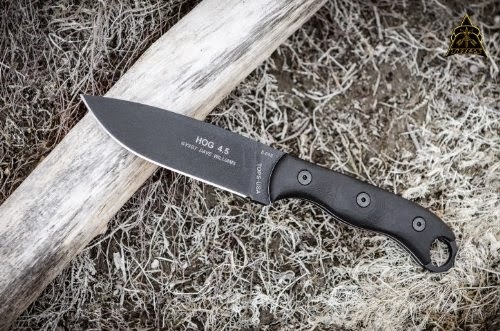 When Tops first unveiled this blade at the shot show Mike Fuller asked me to write up a little piece on the creation of the blade design and how it came to be. The write up ended being longer than expected but then, so did the development of the blade. I don't believe that there is such a thing as a "perfect" survival knife. Everybody has their preference and that is the way it should be. This is designed for my preference and the ways that I use a knife. Not everyone will agree with that, but I have not heard any complaints and this blade has been on the market for some time. I have put a link to a review of it on YouTube because it doesn't make much sense for me to review my own knife design. That just seems a little biased and egotistical to me. HOG is a name earned by a certified US Marine Scout Sniper. HOG means Hunter Of Gunmen, because we hunt men with guns. We HOGs are a force multiplier for any commander that chooses to employ us. The design for this blade started somewhere in my history that I cannot fully trace. It began in the early years of my career as a young Marine Infantryman. After spending days or weeks at a time in a field environment it seemed that my hands would always ache. I eventually traced this pain back to the blades that I was carrying and using. The Tacti-cool handles on those blades all had rough edges and sharp corners. Sure they were mean to look at and gripped like a gator but they didn’t have the comfort that I needed for sustained field use. After this realization I set out to design the best knife handle that I could in my limited experience. Little did I know at the time, this would take the better part of my career to complete. I started with a piece of wooden closet rod and carved in the features that I most liked in many of the knives that I have used. I kept this in my pack for a long time and modified it with a piece of sandpaper as I discovered new ways to use a knife. Whenever one of my field knives earned me a hot spot I grabbed that little handle mock up and made a subtle change so that it did not irritate that hot spot. This went on for many years and many times this piece was over worked and restarted new. Eventually I had the handle shape that worked wonderful in my hand. So I looked to buy a knife that had a handle close to the one that I had designed. I found one and set out on the next phase of simply using the blade as much as possible while making subtle changes to the handle. This also led to my developing a greater understanding of how to use a knife to accomplish field tasks while also conserving energy. With the handle done I realized that there was another problem brewing. The blade designs were just not up to the task that I needed them for. Some of the better shapes were too thick and some too flimsy. Some had bad edge geometry that would just not hold the keen edge needed for a good field knife. This continued through out many years and on to my instructor position at the 1st Marine Division Scout Sniper School. I was fortunate in that I was the primary instructor for survival, fieldcraft and combat tracking. This gave me the opportunity to sample many, many knives that my students had in their kit. Believe me, Snipers love knives like coyotes love meat. In doing this I developed an attraction to wide blades with keen edge geometry. The problem was that there were not any available that I could find that would meet both my blade and handle requirement. Not that I was the expert but I knew what I needed and that was good enough for me. So now, I was armed with this Ideal field knife that does not exist. So I set out to make this knife exist. I made a wooden knife from start to finish and carried that in my pack everywhere so every time that I had an issue with whatever knife I was carrying, I could sand my wooden blank to remedy it. Some Marines thought that I was crazy being a Marine Sniper in the field with a wooden knife in my pack. I just claimed that I was doing research and development, that usually quieted the cries of wanna-be and mall ninja. Never the less I continued to refine the design. Occasionally I would over work the handle and have to start again with a fresh model. Fast forward a few deployments and I landed a job at the Mountain Warfare Training Center as the SNCOIC of Mountain Survival and Mountain Scout Sniper Courses. Of course that meant lots of field time. In order to be a qualified red hat you have to complete winter and summer mountain leader courses and that means practically living on the mountain. I continued to refine the design until I could think of no more refinements. Then, one time on the mountain while skinning a rabbit I set my knife in the snow and the knife disappeared. Already half starved there was no way that I was going to dig down and retrieve it so I went back to the drawing board with my knife design. I wanted a way to retain my blade and not have to have six feet of dummy cord attached to it. That is when the hole was born. I made the hole big enough to handle a standard issue carabineer so that it could be clipped to my gear rather than set on the ground when working. It is a bad ideal to put a bloody blade back in the case while skinning game, if you do, you will only do it once after you learn that lesson. This worked well and eventually I discovered many uses for that hole. But I don’t want to get ahead of myself here. When I thought that I had the design about as good as I could make it I sent it, and a larger version of it, to my good friend and mentor Ron Hood. I had asked for his opinion on the overall design, and I asked him if he could find any obvious flaws in the design that I may have overlooked. Ron never got back to me as he was busy with his new magazine and all the other projects that he had going on. So I let the issue rest. At first I figured that Ron must not have liked it, but then I realized that if he didn’t then he would say so. I have never known Ron Hood to sugar coat anything, perhaps that’s why we got along so well, it is comforting to know people that can handle the truth. Well much to my surprise I soon received a package in the mail. The package was from Ron and it contained two complete knives of my design, rendered exactly as I had designed them. I immediately called Ron to thank him and scold him for such a wonderful gift. He told me that since I designed theses knives over many years for how I use a knife then his opinion was irrelevant. So he had them made by Luke Swenson so I could take them to the International SERE Instructors course winter portion in Elverum Norway. So I did just that. For three weeks in that portion of the course I traveled all over the Norwegian country side, on skiis and homemade snowshoes. The knives provided me with shelter, fire, water, food, and the ability to craft practically anything that I needed to survive. Most importantly, they did not create hot spots or blisters on my overworked hands. My instructors and fellow students admired the blade and my ability to use it effectively for survival tasks. Back home on the mountain it served me well for the remainder of my tour. It is still to this day my favorite blade and you will rarely ever find me without some version of it on my belt. The beautiful lines of this knife were an unintended quality that verifies the saying “form follows function.” Another important feature that I build into the knife is that the tip of the blade is lined directly in the center of the handle. This is important because it provides the user with tip awareness similar to an ice pick. For some reason the brain seems to be able to calculate exactly where that tip is, even when working blind inside of an animal carcass. This tip awareness is valuable in any combatants’ kit because you never know when you may have to transition between opening an MRE and ventilating insurgents. The carabineer hole in the back was never intended to be a gimmick and I don’t believe that it is. It was born out of necessity and has proved many times over that it is well worth the small patch of real estate that it occupies in the handle. I discovered many uses for that little hole over the years. It makes a great lever for almost any task requiring a little more leverage, like braking up kindling and fire straightening expedient arrow shafts when they are hot. I have broken the bones of small game to expose the marrow for soups. I have used it to strip small branches clear of twigs and even as a gauge to make a split piece of wood round enough to use for a bow drill. A carabineer clipped in the hole makes a stout handle extension to aid in the blades chopping power when used in conjunction with a rear pinch grip. I have used it as a pot lifter and even to pull stuck tent stakes from the frozen ground. The truth is that the hole is limitless in its possibilities and the more you carry and use this blade the more uses that you will find for it. It is, much like the Marine Scout Sniper, a force multiplier and you will be glad to have it by your side when it matters. So there it is, love it or hate it. I do have to say, I've known Norseman online for a number of years, and had the pleasure of watching his designs develop and seeing this knife in many of it's custom iterations it's always been tops on my list to purchase one. Now, even though that may bias me somewhat, objectively, having used this blade as my primary for about 8 or 9 months now, I have to say it is easily, hands down my favorite knife. The balance, contours, ergonomic comfort and blade shape all come together to make this hands down the most comfortable, workable knife I've ever used. I have had a lot of "Favorite" knives over the last 30+ years, and most are just marginally more favorite than the last, but this one blows the others out of the water. I did a full review on my blog. But just leave it to say, you cannot go wrong with this knife. One hell of a great knife. Thanks Doc. I appreciate the comment and the review. Ill move that link up to the top where it will work. It is a sheer pleasure to work with. Thanks Arctodus, I hope that it serves you well for many years. I picked up a HOG a couple of months ago and it has quickly become my favorite replacing my BOB as my favorite knife go to knife. It is just feels good in the hand and excels at what a knife is supposed to do: cut. It is hard for me to find a knife that is comfortable for prolonged use as I like to sit around and carve wood for hours and, at least in my hands, never becomes uncomfortable or tiring. That big carabineer hole is actually pretty versatile for things like burn bowls and scraping too (I checkered the outside of mine with a file to suit my uses). I just need to find a nice leather dangler sheath for it. Awesome knife and thank you for designing it. Pairs up perfectly with my Gransfors Wildlife Hatchet. I really hope to pick up one of your customs at some point, love the designs and based on the HOG I'm a believer. Omar, the nylon sheath has been a topic of much debate with Tops, Not only on the HOG but many of their other models as well. Because of this Tops now offers a leather dangler style sheath with a fire steel loop, for the Hog. I have one in black and one in brown, I can say that I recommend them without reservation, they are stout, tight fitting and built right. Thanks for your comment. I really like Tops and I also have a DART (also a great knife) with the same nylon sheath and associated issues, button snaps and a lower strap would do a lot, but the HOG sheath at least makes a great sheath to strap to a pack because of the flap. As a belt sheath it's serviceable. Thanks for the tip on the leather sheath, I had seen those they're just sold out everywhere so waiting on re-stock in the Great White North. The Dart was designed by Trace Rinaldi. Trace is one of the guys that got me started in knife making. He and Luke Swenson have helped to shave years off my learning curve in both design and manufacture of handmade customs. Great dude and a great blade.